Smelly cat, smelly cat... what are they feeding you? While we may never know the answer to that deeply philosophical musical question that Phoebe Buffay once asked on Friends, we will have the opportunity to at least see what the (mock-up) stage on which she performed looks like. The Today Show's Jenna Wolfe reported live from New York City's pop-up Central Perk, and she — fittingly — serenaded Hoda Kotb with Phoebe's classic single, "Smelly Cat." It's not your fault, Hoda. 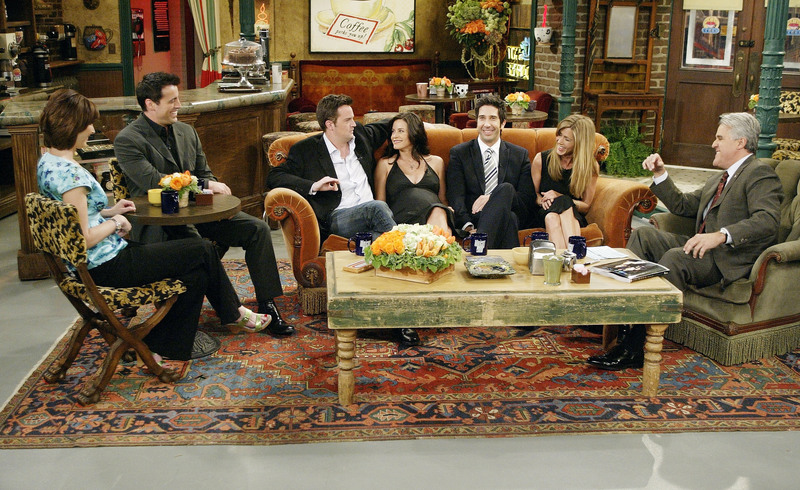 Denizens of New York City can experience this magic, too (well, maybe not the Jenna Wolfe serenading you part), if they sojourn down to 199 Lafayette Street to visit the pop-up pseudo Central Perk in honor of Friends' 20th anniversary. You'll be able to sit on the big orange couch while squished between a zillion other Friends fans! You'll be able to sip coffee uncomfortably while squeezed into the armpit of another sweaty New Yorker! You'll be able to recite all of your favorite Friends' quotes against a backdrop of a million other people doing the same thing! Gunther might be there! Stop everything for Gunther.